Easily print high value receipts and invoices mobilely - with the PR3 receipt printer from Honeywell, of course. Use the 84 mm printer flexibly in numerous applications both indoors and out mobile POS applications, receipt and invoice printing, etc. 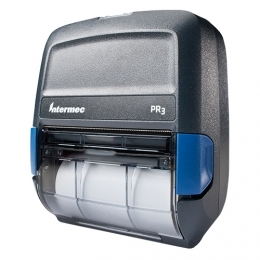 The optionally available magnetic stripe reader expands the variety of applications of this compact printer. Its robust housing protects it against dust and splash water IP42-certified, as well as falls from medium heights. In short it holds its ground on a challenging daily basis. As needed, the battery may be replaced easily on-site. With the help of intelligent battery management you always know when it is time to exchange it. When the battery is empty, charge it either directly on the printer or separately. Functions, such as a remote control and easy integration via all common printer languages facilitate smooth operation. Connect the PR3 easily and quickly via USB optionally wirelessly via Wi-Fi or Bluetooth. For more carrying comfort there is an optionally available holder for the PR3.